SUICIDE THEATRE, aka THE LITTLE THEATRE – When you spend your life happily wallowing in oddities like I do, you often get the mistaken impression that everybody must be as aware of the out of the way nuggets of joyous weirdness as you are. I was assuming that the presence of future Star Trek star Deforest Kelley in the surviving footage of this incredible television rarity made Suicide Theatre as well-known as Mr Spock’s ears. Today I had a conversation with two very special ladies (and you know who you are – I’m kidding) who are usually pretty deeply immersed in the weirdass wonders of life but they had never heard of this show. In a way it’s serendipity that a recognizable face like Kelley portrays the unfortunate man contemplating suicide in this playlet followed by psychological commentary on depression and suicide PLUS critical evaluation of the performers in the playlet. If it was an unknown figure starring as the down-on-his- luck character in this one and only example of Suicide Theatre plenty of people (myself included) would probably be convinced the surviving footage must be a hoax with modern-day people dressed up in 1950s clothing and surrounded by 1950s-era furniture. 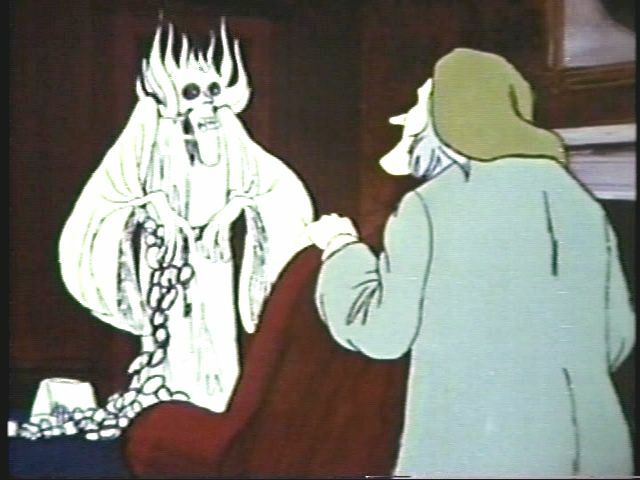 I’ll come right out and admit it – I’ve always been a sucker for any version of A Christmas Carol. Trouble is, most adaptations distort the story or are produced by people who don’t seem to “get” the story or treat it like it’s a children’s tale. Anyone who thinks that needs to read the novel. My love of mythology is partly why I love the story so much. A Christmas Carol is the closest thing to an Epic Myth the Industrial Age has produced. The language Dickens uses is very close to prose poetry but precious few adaptations of the story preserve enough of it. Welcome to Balladeer’s Blog’s Third Annual Christmas Carol-A-Thon! I have several dozen video versions of the Charles Dickens classic and for years now I have filled the time between Thanksgiving and Christmas watching umpteen different adaptations of this epic myth of the Industrial Age. The 2012 edition of this Carol-A-Thon begins with the 1969 Australian cartoon version as a shoutout to the KiwiAussie herself, Jo “Buckshot” Bryant and her blog Chronicles of Illusion. TEAM OF DESTINY? – The MORNINGSIDE MUSTANGS have come into their own the past two seasons as the new masters of the Great Plains Athletic Conference after the University of Sioux Falls moved over to NCAA Division 2. The 2011 postseason ended with a disappointing early exit from the playoffs for the Mustangs. 2012, however, has found them increasingly referred to as this year’s “Team of Destiny” after a close call against the MONTANA TECH OREDIGGERS last week and a tough Overtime win yesterday against the SOUTHERN OREGON RAIDERS. The final score in this Instant Classic was 47-44. BACK IN THE FINAL FOUR – The MARIAN UNIVERSITY KNIGHTS continue to make Balladeer’s Blog look like a gridiron Nostradamus for designating them as THE up-and- coming power in NAIA football a few years back. After another stellar season, much of which they spent in the number 1 spot in the rankings, the Knights have made it to the Final Four for the second year in a row. Yesterday Marian advanced with an authoritative 45-34 win over the SAINT FRANCIS (IN) COUGARS. THE HEART OF A CHAMPION – Chicago’s SAINT XAVIER UNIVERSITY COUGARS, the defending champions of NAIA football, continue their defense of their title. Yesterday the Cougars joined Morningside and Marian in the 2012 Final Four by defeating the powerhouse UNIVERSITY OF THE CUMBERLANDS PATRIOTS by a final score of 35-21. THE DEFENSIVE EPIC OF THE POSTSEASON – The MISSOURI VALLEY COLLEGE VIKINGS filled the last slot in this season’s Final Four in the NAIA. The Vikings had their hands full with the BETHEL (TN) WILDCATS, who toppled the top-ranked GEORGETOWN (KY) TIGERS last Saturday. MVC avoided being the second victims of a Bethel upset by winning this 10-7 game for the ages. 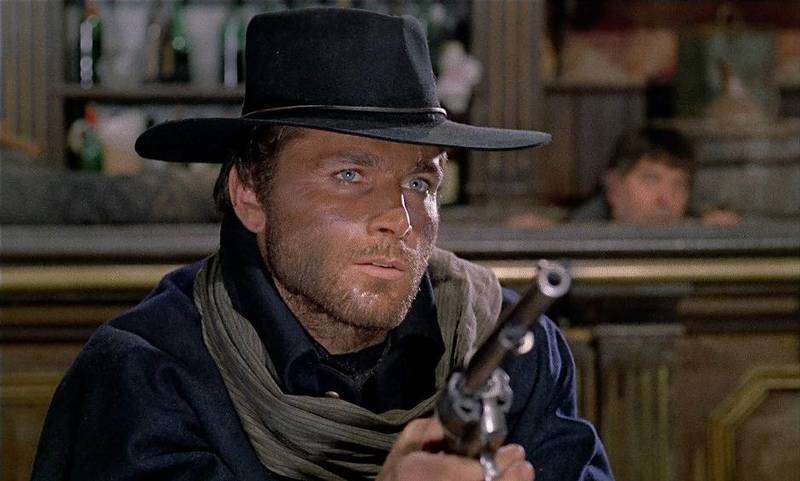 With Quentin Tarantino’s Django Unchained coming out soon Balladeer’s Blog has been taking plenty of looks at the original Django movies as well as presenting this fictional biography of the gunslinger. After Django’s 1862 adventure with the Gatling Gun and Belle Boyd he returned to his unit, the 7th Kansas Cavalry AKA “Jennison’s Jayhawkers”. He arrived shortly before the 7th’s participation in the Battle of Iuka on September 19th. It was a busy autumn for Django and his comrades, as their unit also fought in the Battle of Corinth on October 3rd and 4th, with their pursuit of the retreating Confederates going on until the 12th of the month.